Publication details: Book. 2012. xii and 266 pages. Publication date: 2012-10-23. many full color illustrations. Hardbound with dusk jacket. 16x24 cm (6.3x9.4 in). This book is a compilation of 25 years of work. Readers will gain an in-depth understanding of the mechanism of accommodation. The investigator will learn the challenges and pitfalls of performing accommodative experiments. Critical thinking, an unbiased view and an open mind, will enable readers to appreciate the beauty and efficiency of the accommodative mechanism and its relationship to other physiological and physical phenomena. This work is an exciting academic challenge. From basic experiments to sophisticated mathematical and physical analyses, constructing a final path toward understanding accommodation and presbyopia has been intellectually rewarding. Reaching that final path was possible only with the dedication of my wife, Kathy, and my children, Ira, Elise, Eli, Leah, and Asa, who contributed in numerous ways, including editing text and writing computer programs. I am indebted to my loyal, best friend Norman S. Levy, M.D., Ph.D., who understood the intricacies of the project, was able to keep me focused, and made me reevaluate each step of the way. He spent considerable time editing, discussing, and evaluating each new finding. I cannot thank him enough for volunteering precious time from his ophthalmic practice, research, and family. A special thanks to professors: Truman D. Black, Ph.D., "Leo" Tseng Huang, Ph.D. (1925-2006), Dale A. Anderson, Ph.D., Farhad Kamangar, Ph.D., Ali Abolmaali, Ph.D., Guojun G. Liao, Ph.D., Zdzslaw Musielak, Ph.D., George Rosensteel, Ph.D., Roger W. Chan, Ph.D., and their graduate students: Donald P. Cudmore, M.S., Russell Torti, Ph.D., Victor W. Shung, Ph.D., Chang-Hai "Michael" Chien, Ph.D., Tri Le, Ph.D., and Roger D. Kirby, Ph.D. for their insights, loyalty, and willingness to work at all hours to perform difficult experiments and solve arduous problems. Wickham Chen Robert Ritch, M.D. Carlos Davila, Ph.D. Jannick P. Rolland, Ph.D.
Deborah K. Fygerson, Ph.D. David J. Schanzlin, M.D. Xin Huang, Ph.D. Victor W. Shung, Ph.D.
Roger L. Kash Celso Tello, M.D. Annemari Koivula, M.D. Russell Torti, Ph.D.
Jeffrey M. Liebmann, M.D. James C. Wyant, Ph.D. I wish to acknowledge the editors of the British Journal of Ophthalmology, Randall T. Bellows, M.D., editor of Annals of Ophthalmology, and Mitchell H. Friedlaender, M.D. (1946-2011), editor of International Ophthalmology Clinics, for their diligence in insuring unbiased peer review and objective evaluation. Their publication of the challenging and new concepts reflects the responsible leadership, editorial excellence, and foresight each has provided to their respective journals. Finally, I reserve special thanks for Barbara K. Pierscionek, Ph.D. for her willingness to challenge the status quo, to maintain an open mind, and her unwavering curiosity and commitment to scientific truth. This whole endeavor has been and continues to be fun! Ron Ronald A. Schachar, M.D., Ph.D. The human eye is a remarkable optical device. In less than a second, a young human eye can accommodate from infinity to closer than 10 cm. Accommodation occurs with minimal effort and can be rapidly repeated with no apparent evidence of fatigue. Unfortunately, maximum accommodation decreases throughout life and by the fifth decade leads to presbyopia, the inability to read at a normal working distance. Interestingly, the mechanism by which the human eye is able to adjust focus has been debated for over 300 years. No previous theory has been put forth that can account for all the physical changes known to occur during accommodation. Accommodation occurs as a consequence of a change in shape of the lens of the eye. The key changes during accommodation are central surface steepening combined with peripheral surface flattening, a shape that I refer to as the "steep profile". In this treatise, I employ mathematics, physics, mechanics, physiology, and anatomy to fully explain the mechanism of accommodation. 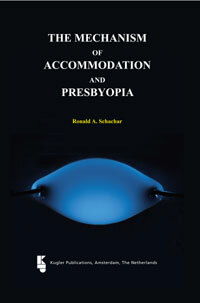 The book begins with a short introduction to accommodation and its present theories. Readers are then introduced to the mathematical analysis of an ellipse and the changes that occur in its shape when its major axis is increased under constraints that simulate the human lens during accommodation. This approach is taken to demonstrate that the shape of the accommodated lens is just one manifestation of a fundamental and universal phenomenon, the steep profile. This basic understanding is then used to predict the amplitude of accommodation of different vertebrates. Next, the anatomy and physiology basic to the accommodative mechanism are investigated and the experimental evidences supporting and contradicting the steep profile mechanism are evaluated. Then, sophisticated mathematical and finite element analyses are applied to fully describe the major parameters that affect accommodation and its age-related decline, which results in the universal manifestation of presbyopia in the fifth decade of life. This is followed by a discussion of the experimental controls required to observe the accommodative mechanism. In an example of the universality of the steep profile phenomenon, the implications of steep profile formation on lenticular galaxy evolution are presented. The book concludes with a summary of findings that must be observed during accommodative experiments. Included in the appendices is a MATLAB software program for demonstrating a steep profile in an ellipse and complete copies of pertinent published papers.